CLEMSON – Clemson ice cream has been around for 100 years and on July 28 the public will have an opportunity to become a part of this deliciously sweet tradition. Clemson family and friends are invited to make their own Signature Clemson Ice Cream July 28 on the Clemson University campus. The first-ever Clemson Ice Cream Makers Day is slated for July 28 in the only place where Clemson ice cream is made — the Ice Cream Innovation Laboratory in Newman Hall and the Class of ’55 Exchange on campus. Groups of family, friends, or both are invited to come and make their very own signature flavor of Clemson ice cream during one of three time slots – 11 a.m., 1 p.m. and 3 p.m.
Pre-registration and pre-payment are required. Cost is $40 per group, limit 10 people per group. Youth participants should be accompanied by an adult. Registration must be done in person at the Class of ’55 Exchange ice cream shop during normal store hours. No phone-in or online registration allowed. Store hours are 11:30 a.m. to 8 p.m. Monday through Thursday, 11:30 a.m. to 6 p.m. Friday and Saturday, and 1 p.m. to 6 p.m. on Sunday. The Class of ’55 Exchange is located in the Clemson University Hendrix Student Center, 720 McMillan Road, Clemson, S.C. 29631. 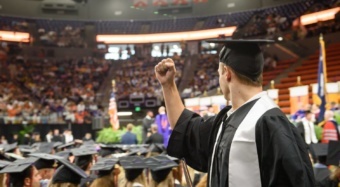 Participants in the July 28 event will be led by Clemson food science students Marianna Painter, a master’s student from Myrtle Beach, Kelly Polte, a junior from Elmhurst, Illinois, and Jonathan Dillard, a senior from Conway. This event will be the first time customers will be allowed to make their own signature Clemson ice cream, Painter said. Each group will create its own ice cream from start to finish with help from food science students who work for the Class of ‘55 Exchange. The groups will receive a list of all of bases, flavorings, mix-ins and variegates. Ice cream variegates are used to add extra texture or dimension to any ice cream. From the list they are given, each group will create a recipe for their new flavor of ice cream. Food science students will be available to give suggestions and demonstrations but the majority of the work will be done by participants. For more information, contact Johnny McGregor at 864-650-0817 or johnny@clemson.edu. The Class of ’55 Exchange is a student-run business that designs, manufactures, sells and serves Clemson ice cream and other products. Tasting for Donations: Who knew reaching out to the community could taste so good?